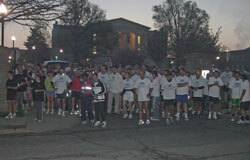 The few, the proud, the brave, were out before daylight this morning to participate in the annual Alltech Fun Run. We had a big crowd of international runners doing laps around Transylvania University. I’m just now getting ready for the opening session so this is just a quick post to shame all you who slept in this morning instead of getting out and working off some of that good Kentucky Ale.